Whether it's opening night for a Broadway musical or launch day for your app, both are thrilling times for everyone involved. Our agency, Posse, collaborated with Hamilton to design, build, and launch the official Hamilton app... in only three short months. We decided to use Firebase, Google's mobile development platform, for our backend and infrastructure, while we used Flutter, a new UI toolkit for iOS and Android, for our front-end. In this post, we share how we did it. We love to spend time designing beautiful UIs, testing new interactions, and iterating with clients, and we don't want to be distracted by setting up and maintaining servers. To stay focused on the app and our users, we implemented a full serverless architecture and made heavy use of Firebase. A key feature of the app is the ticket lottery, which offers fans a chance to get tickets to the constantly sold-out Hamilton show. 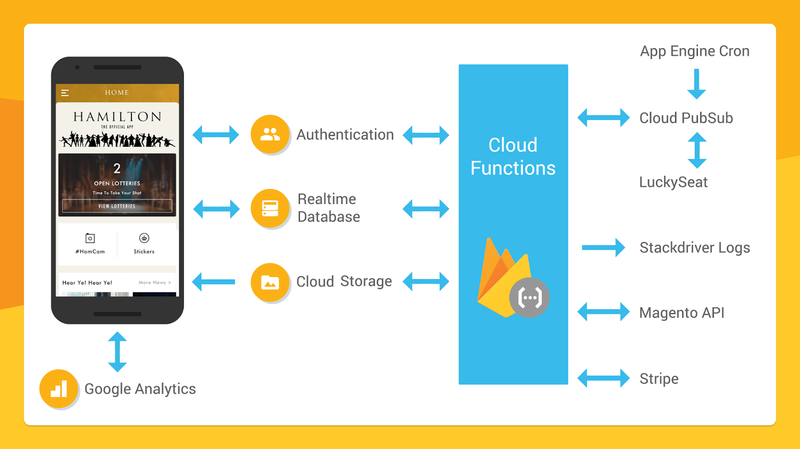 We used Cloud Functions for Firebase, and a data flow architecture we learned about at Google I/O, to coordinate the lottery workflow between the mobile app, custom business logic, and partner services. For example, when someone enters the lottery, the app first writes data to specific nodes in Realtime Database and the database's security rules help to ensure that the data is valid. The write triggers a Cloud Function, which runs business logic and stores its result to a new node in the Realtime Database. The newly written result data is then pushed automatically to the app. Because of Hamilton's intense fan following, we wanted to make sure that app users could get news the instant it was published. So we built a custom, web-based Content Management System (CMS) for the Hamilton team that used Firebase Realtime Database to store and retrieve data. The Realtime Database eliminated the need for a "pull to refresh" feature of the app. When new content is published via the CMS, the update is stored in Firebase Realtime Database and every app user automatically sees the update. No refresh, reload, or pull required! 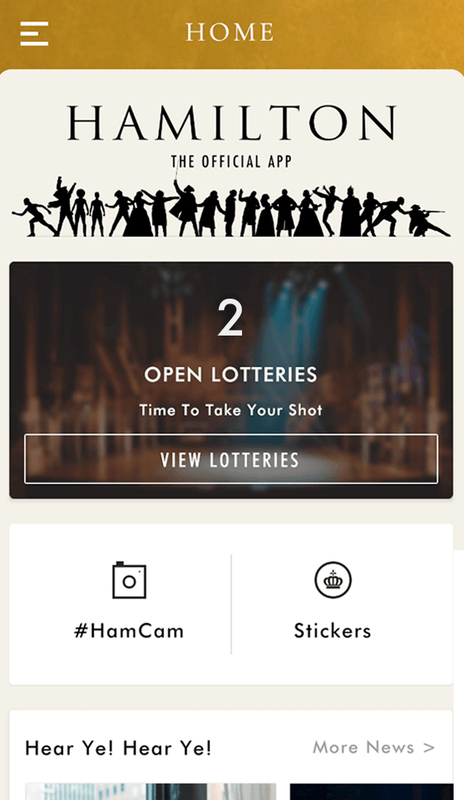 Besides powering our lottery integration, Cloud Functions was also extremely valuable in the creation of user profiles, sending push notifications, and our #HamCam — a custom Hamilton selfie and photo-taking experience. Cloud Functions resized the images, saved them in Cloud Storage, and then updated the database. By taking care of the infrastructure work of storing and managing the photos, Firebase freed us up to focus on making the camera fun and full of Hamilton style. Developing UI? Don't Wait For It. With only three months to design and deliver the app, we knew we needed to iterate quickly on the UX and UI. Flutter's hot reload development cycle meant we could make a change in our UI code and, in about a second, see the change reflected on our simulators and phones. No rebuilding, recompiling, or multi-second pauses required! Even the state of the app was preserved between hot reloads, making it very fast for us to iterate on the UI with our designers. We used Flutter's reactive UI framework to implement Hamilton's iconic brand with custom UI elements. Flutter's "everything is a widget" approach made it easy for us to compose custom UIs from a rich set of building blocks provided by the framework. And, because Flutter runs on both iOS and Android, we were able to spend our time creating beautiful designs instead of porting the UI. The FlutterFire project helped us access Firebase Analytics, Firebase Authentication, and Realtime Database from the app code. And because Flutter is open source, and easy to extend, we even built a custom router library that helped us organize the app's UI code. We enjoyed building the Hamilton app (find it on the Play Store or the App Store) in a way that allowed us to focus on our users and experiment with new app ideas and experiences. And based on our experience, we'd happily recommend serverless architectures with Firebase and customized UI designs with Flutter as powerful ways for you to save time building your app. For us, we already have plans how to continue and develop Hamilton app in new ways, and can't wait to release those soon! If you want to learn more about Firebase or Flutter, we recommend the Firebase docs, the Firebase channel on YouTube, and the Flutter website.